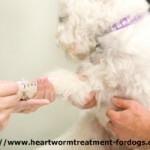 Before using any type of preventative dog heartworm medicine, your dog must have a heartworm test done by a vet. It is commonly accepted and recommended by the American Heartworm Society that your dog should be tested every year. (Read their full response to the question by using the link). If there are microfilariae present in the blood test, the youngest form of the larvae of this parasite, this means that there are also adult worms present. Using a preventative medicine will result in large numbers of these microfilariae dying quickly and causing toxic shock. Preventative medicines will not kill adult worms although they may shorten their lifespan. Whilst preventative dog heartworm medicine can protect your dog very effectively, you need to be sure that there are no adult worms present, even if your dog has been on a prevention program. Puppies over six months old will also be tested if they have not already begun on a preventative treatment. Twice-yearly injection of a preventative medicine that must be administered by a vet. Heartworm pills which are divided into two types, the plain pills or the chewable type. These are given monthly on the same day each month (see video below). Spot On or Topical treatments which are ‘spotted’ onto the dog’s skin between the shoulder-blades. This video is an advertisement for Heargard but it does make the point that prevention is better than cure. Heartworm pills of whatever type you choose function much the same in that they kill the juvenile larvae. They do not stop your dog from being bitten and possibly re-infected by mosquitoes. If your dog resists taking the pill type, you could either try hiding the pill in a piece of meat, cheese or a specially designed ‘pill pocket’ which makes a tasty treat for your dog and usually results in the pill being taken without trouble. An alternative to the pills is the chewable type of preventive medicine but some dogs are allergic to the ingredients in the chewy part itself and could make this unviable in some cases. If you opt for the spot on type of treatment, it is certainly easier to administer and has become popular because it also controls other types of worms like hookworms and roundworms and also fleas and ticks. As mentioned, heartworm pills should be administered on the same day each month and forgetting to give your dog his monthly pill will reduce his protection so if you realise that you have missed the dose by more than a few days, it is probably wise to check with your vet. If you have missed a couple of doses, your vet may recommend another test, just to be sure that your dog has not become infected before resuming the preventives. If you decide at any time to change from one type of preventative to another, make sure that you change at the time you should have given the next dose of the product your dog is currently on. This will avoid any overload of your dog’s system with too much of the active ingredient in the medication. The old adage that prevention is better than cure takes real life form when it comes to your pet and heartworm. It’s better to be safe than sorry, so don’t take any chances. Make heartworm prevention a priority. Joanne, I hate to say this to you, but this sounds like very dangerous advice to me – please, please, get a second opinion.